Originally posted: March 1, 2017 . Last modified: April 20, 2019 . Easy gluten free Southwest style quiche starts with the traditional French preparation then infuses it with fresh and smoky flavors from the Southwest. Kim and I were talking a few nights ago, and we were discussing the blog. While we love many of the recipes offered, we recognize the selection is a bit lacking for gluten-free, vegan, and vegetarian food lovers. With that in mind, Kim suggested that our next few recipes include something for that audience. I wholeheartedly agree. 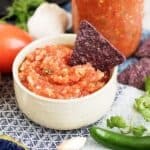 As someone who usually just eats raw fruits and vegetables, when I think about those categories my brain tends to lean towards dips and dressings. But hey, who wants to eat salads all the time? For today’s recipe, I took the traditional quiche and modified it slightly. To make it gluten-free, I simply removed crust. I know I could have used a gluten-free flour or almond flour, etc. Honestly, I am terrible working with gluten-free flours, and I refuse to subject anyone to that kind of culinary torture. Maybe one day I will learn to work well with them, but until then, my gluten-free offerings will probably remove the dough altogether. Now, a quiche without a crust is like a balding coach without a cap. Something’s missing, right? To offset that absence of crust, I infused the quiche with crispy onions, sweet tomatoes, and smoky peppers. These ingredients should also offer a texture contrast to the soft and creamy eggs. It is my hope to entice some people with this recipe, who like me, have specific dietary needs. While at the same time, appealing to individuals craving a change from the normal quiche they usually enjoy. With the addition of spicy flavors and the removal of the crust, I hope to have accomplished my goal. As always, I wish everyone long life, everlasting love, and a full tummy! If you follow our blog then you know I love simple recipes. Meals that can be prepared in one dish are always a great idea. That theme continues here with this simple quiche recipe. In a large mixing bowl crack the eggs and make sure no shells get into the mixture. Then, add the diced onions, drained and diced green chiles and tomatoes, heavy cream, salt, pepper, and Chipotle powder. Afterward, whisk all the ingredients together until they are well blended. The liquid should look like thick and creamy scrambled eggs. With everything completely mixed, take a 9-inch glass or metal pie pan and spray it with Pam or other non-stick product. If you have a non-stick pan, that should work just fine since this gluten-free recipe opts out on the traditional quiche crust. Since the dish may rise and spill over the sides of the dish, I did not pour all the mixture into the pan. I had about a fourth to a half of a cup left over in the bowl. Also, I placed my baking dish in the center of a sheet pan before putting it into the over. I hate the smell of burnt eggs and did not want that aroma in my kitchen should the eggs boil over. Once the dish is filled, bake the quiche in your oven at 350 degrees Fahrenheit for at least one hour. I baked mine a little longer because I kept opening the oven to check on it. The top of my quiche did crack a little, but that helped me with determining when it was done. I also used a toothpick in the center to ensure all the eggs had cooked. After the quiche was done, I let it sit on my stovetop for about five minutes before cutting and serving. We also enjoyed the dish with both Frank’s Red Hot Sauce and Tabasco Sauce. It can be stored in your fridge for about three days. Lastly, it can be reheated in the microwave at half power (five) for about one minute. What’s your favorite egg dish? Some of our favorites are Dutch Baby Pancakes, Deviled Eggs, and Spaetzle. In a large mixing bowl combine eggs, diced onions, drained and diced green chiles and tomatoes, heavy cream, salt, pepper, and Chipotle powder. Whisk until all ingredients and well blended. Pour mixture into non-stick 9 inch pie pan. Dish can be sprayed with non-stick product. Bake at 350 degrees Fahrenheit for approximately 60 to 75 minutes. Monitor while cooking as top can brown quickly. Slice and serve with Frank’s Red Hot Sauce or Tabasco Sauce. Individual slices can be reheated in microwave at half power for approximately one minute. Keep an eye on the dish as it cooks, the top can brown quickly! I’m a vegetarian so I always appreciate these recipes. Thanks for giving me a new spin on making a quiche. Yum! I love quiches and even better when they are gluten-free. My blog I shared a gluten-free dish too ?Us gf bloggers are what make the world awesome! I do crustless quiches like this all the time, so easy! This sounds great! This quiche looks amazing! My Mother In Law has celiac, so I’m always looking for good Gluten Free recipes! Thank you, Kailei! I am so glad that works for her 🙂 I hope she enjoys it! YUMM!! This looks delicious. I love quiches. They are the best for entertaining.